Made of top grade metal material, heavy duty, durable to be resistant. The picture hangers are easy to nail to the wall and hold the picture, tiny nails wont damage your wall, easy to remove, just will leave a small pin hole. Big Value Pack Picture Hanging Kit. Picture Hanging Hook Set - 239 Pieces including 28 each picture hanger (10 lb. steel brass plated), 15 each picture hanger (20 lb. steel brass plated), 15 each picture hanger (30 lb. steel brass plated), 4 each picture hanger (50 lb. steel brass plated), 3 each picture hanger (100 lb. steel brass plated). Supports various objects sizes to suit your needs. 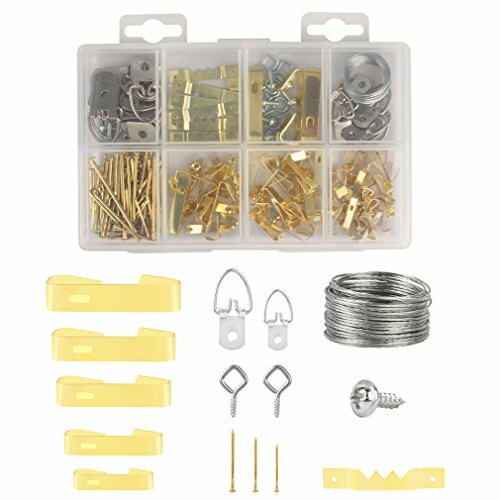 10 each D-ring hangers (20 lb), 10 each D-ring hangers (45 lb), 20 each flat head screws, 1 each strand picture hanging wire, 14 each small sawtooth hangers, 10 each hook screws, 40 each 0.5 inch nails, 55 each 1 inch nails, 8 each 1.5 inches nails, 6 each 2 inches nails. Comes with a handy plastic box to store the hanging kits.